Automatically Create Work Orders - Scroll Down for Free Videos! At 6000 miles or 6 months. When its been 500 hours since last oil change. If an alarm level is met. Every 6 months or 6000 mile change the oil in the service truck. When the cut-off Saw #1 has made 2000 cuts since the last blade change create a work order to replace the blade. Change the lubricant in a gearbox at 500 hours exactly. Notification is through an automatically generated work order that is simply added to the work orders for the day. A parts list is also attached automatically. When Tank #2 has reached a set level trigger a work order and email it to the maintenance manager to begin the cleaning process. Begin by creating the work order that you would like to have automatically generated when this meter expires or is triggered. 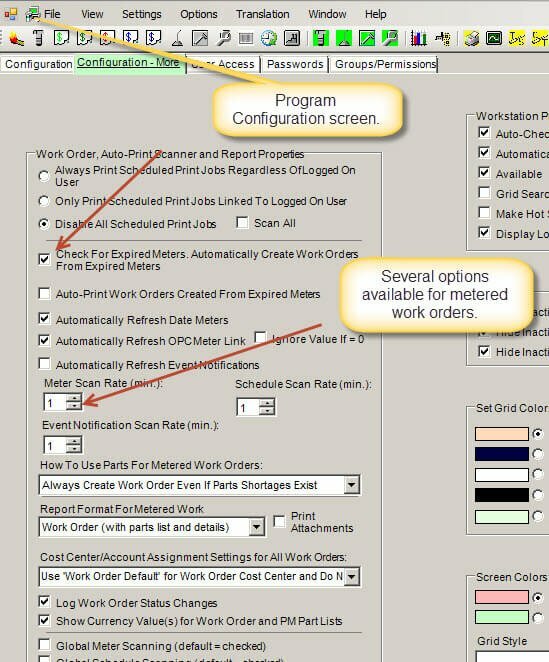 Go to the work order screen and create this work order just like any other work order. Add unlimited details and file attachments if needed to fully describe the job. Save the new work order. Select the work order from the grid then right-click and choose Save Work Order as Template from the context menu. Give the work order template a user-friendly name. Create a meter unit, link the unit (or units) to the work order template then link the equipment related to this work order template to a meter reading record. This is where the actual readings are entered either manually or automatically. The work order template is now ready to be triggered. Triggering this work order template causes a new work order (identical to the template) to be generated automatically. The meter scanner is the final step automatically create work orders upon equipment demand. The scanner may be set to check for expired meters every 1-60 minutes. When an expired meter is found it immediately creates a new work order, complete with parts lists, detailed instructions and file attachments. Furthermore this new work order is either emailed or printed too. The meter scanner is turned on in the Program Configuration screen. This only need to be done one time. Only MaintSmart enables you to generate work orders automatically based upon equipment demand. This capability is included in the MaintSmart base program. No other CMMS offers this at any price!